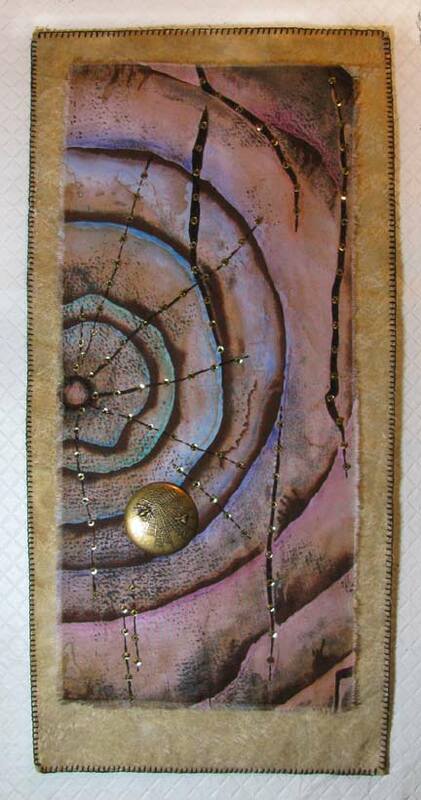 So here is how I finished up the sequined quilt that I began showing you last week. It would have been better to have painted the outside portion of batting before quilting if I had known then how I was going to finish it. Oh well! 1. Paint the batting that sticks out beyond the top fabric. Let it dry thoroughly. 2. 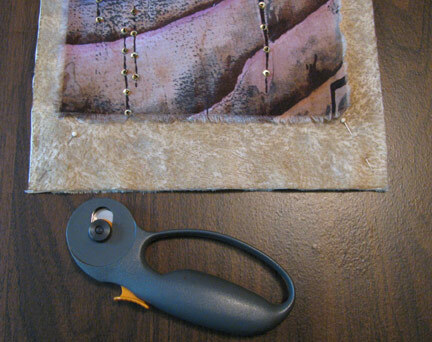 Choose a backing fabric and cut it even with the batting "frame". 3. 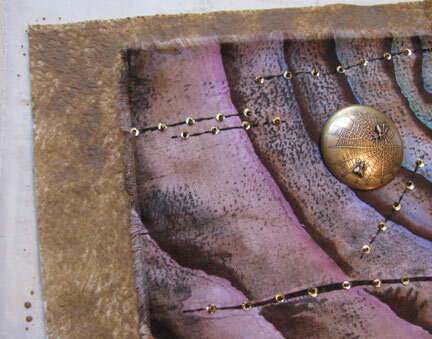 I used my favorite blanket stitch all around the outside, stitching just the batting and the backing together. Another option would have included adding another row of blanket stitch around the top fabric, stitching it just to the batting before adding the backing, but I decided to keep the edges of the top fabric raw. 4. The finished quilt. I added a few small buttons to the back (not shown), stitched through all the layers, to keep the heavy decorative button from sagging (see an example of how that's done here). 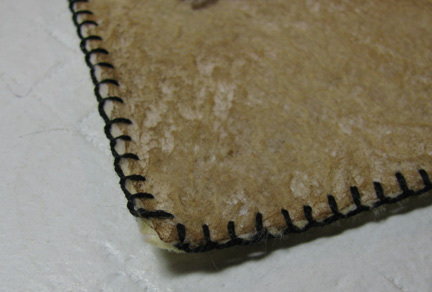 I've just discovered and fallen in love with the blanket stitch. I'm using it to finish off my stuffed felt ornaments, and it's perfect! I can't seem to find anything better than hand stitching...tedious, nit-picky, I love it! Very pattable! Hand-stitching is very relaxing and gives far more satisfaction than using a machine,no matter how wonderful modern machines are. It gives the piece personality. Love it! The blanket stitch finishes it off perfectly! I love this piece, Cyndi!!!! It's GREAT!!!!!! Hand stitching is very relaxing. Cyndi, you did a great job! It's beautiful, Cyndi. The blanket stitch is just perfect. Another row of it (around the sequined panel) would have been too much I think. Thank you! It seriously wasn't laziness...I just couldn't bring myself to cut off those beautiful raw fringed edges. It's beautiful, I love how it turned out!